Negative 25, 8 inches of new snow, and I suggest heading out for a walk along edge of the float pond. Suddenly, I realize the insanity of my proposition. I imagine a headline in the Fairbanks Daily News Miner: “Crazy Woman, Husband, Found Frozen at Chena Marina. Baby Grandson Survives.” Are we actually going to recreate in this refrigerator? I remember another -25 day back in the 90’s. My daughter was a student at the University of Alaska and we drove up to Circle Hot Springs through rolling waves of frozen tundra. We wanted to thaw out in the worst way, but after we plunged into the boiling mineral pool and lifted our heads out of the water, our nose hairs became icy stalactites, which has to be one of the strangest sensations ever for a nose breather. Not only that, we could pull the hair on our heads into ice spikes that made us look like Statues of Liberty in bathing suits. That evening, we heard a choir of wolves howling with such ferocity that it was impossible not to open our log cabin door. When we stepped outside what we saw was miraculous. Above us, almost close enough to touch, a 360-degree green, red and white aurora flickered, twisted, waved and shimmered across the sky in an infinite variety of configurations that took our breath away and made us howl. And we howled, and we howled and we HOWWWWLED until the wolves called it a night and there was nothing left but borealis light. This was not our usual subdued Northwest behavior. “Let’s do it!” R says way too fast about the walk. It’s easy for him; he’s been to Antarctica. Little r wants to spend another 10 hours playing with his train collection. I’m tired of trains, as is R, so we boycott the wee guy and tell him he needs vitamin D.
“No need vitamin D! No need vitamin D!” little r shouts in vain. 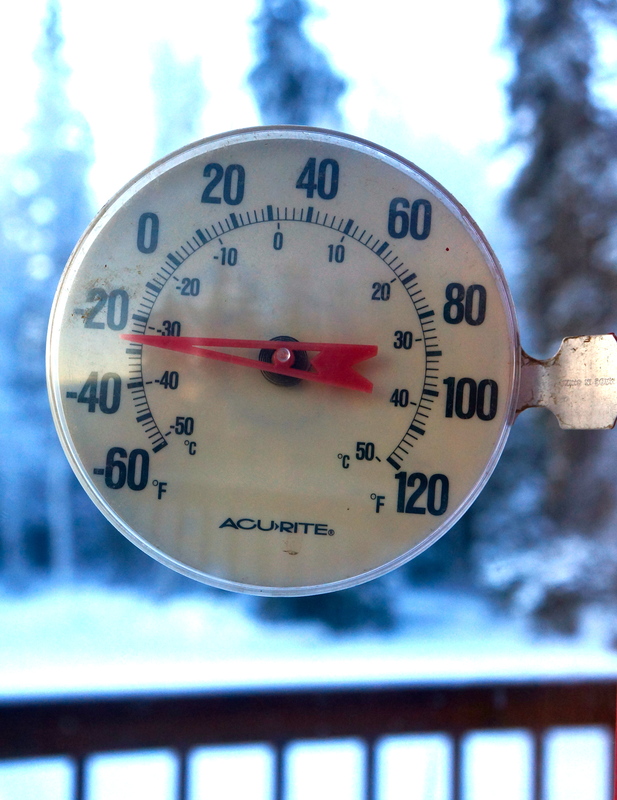 Before we can walk out in “damn cold” weather, which means below minus 20 in Interior Alaska, we have to suit up. For R, little r and me this means encasing ourselves in layers: wool undies, flannel-lined jeans, turtle necks, fleece vests, down jackets, heavy parkas, wool caps, mittens, fake fur-lined snow boots, and sunglasses. Yep, sunglasses; though the sun here is short-lived and low to the ground it’s intense enough to bubble your retinas. When the three of us finally head out we don’t so much walk as waddle like penguins. Little r rides his push-bike along the airstrip that parallels the float pond, commenting non-stop in his adorable toddler voice about everything he sees. 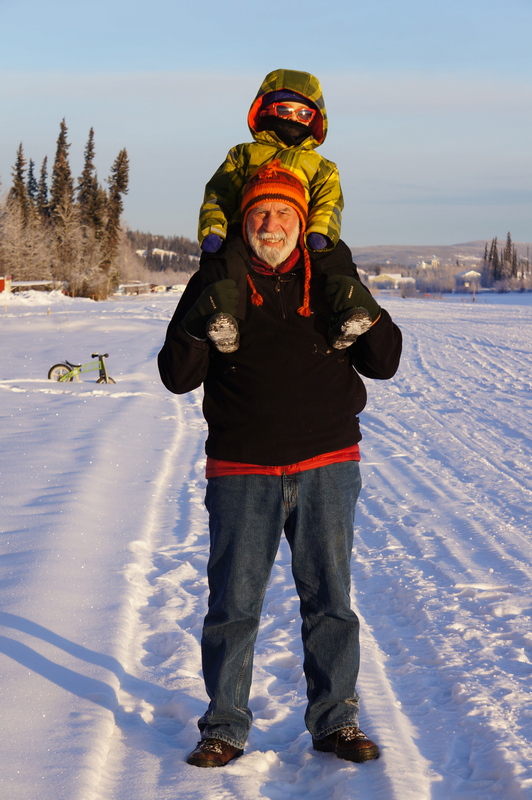 A layer of ice under the snow makes for lots crunchy bumps to glide and slide over, and when little r grows tired of falling I plant the bike in the snow and R carries his grandson on his shoulders. Already we sense the chill. Our eyes feel dry but won’t stop watering. It makes no sense. Crispy nose hairs? Check. Our cheeks sting and our fingers are numb. I want to head back to the house, even if it means hours pushing toy engines…Thomas and Rosie and Charlie…on wooden tracks, but there’s something happening with the light all around us that makes me feel like we’ve passed through some holy portal and have entered the winter vacation destination of God. Everything seems brighter and blingier than normal, sparkling, like the world is blanketed in a million tiny prisms, or diamonds. There are three suns hanging low in the sky, the middle one whiter than white, with a smaller, rainbow sun dog on each side. The snow is golden. The sky is a perfect ultramarine blue. Little r just points because, even to him, such beauty is indescribable. And then we see the chair. Up ahead, at the edge of the float pond an Adirondack chair casts long blue shadows in the snow, an indication that it’s close to three in the afternoon and the sunlight is about to bail on us. 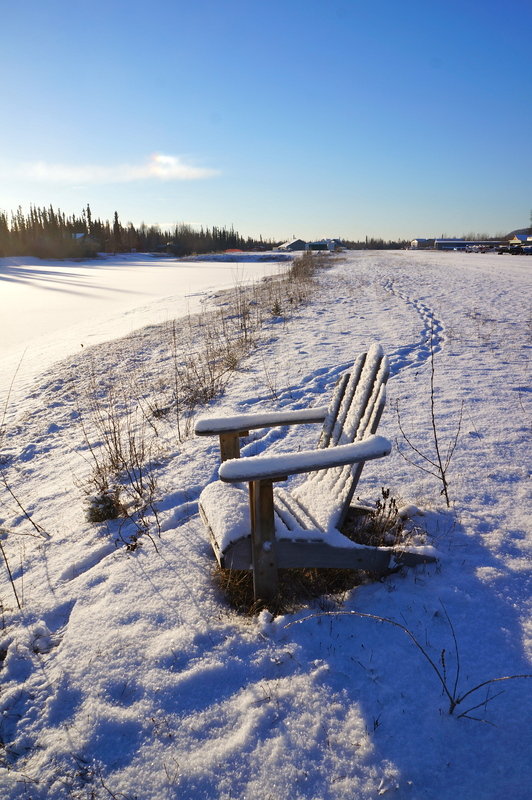 Covered with ice frost and facing out toward the frozen water, it looks as if someone has actually been sitting in the chair, basking in what remains of, the blinding, heatless sun. We plunk down little r on the seat and call him “Le Petit Prince.” The temperature is dropping rapidly; we’re feeling it in our lungs now, shallow breathing, coughing. 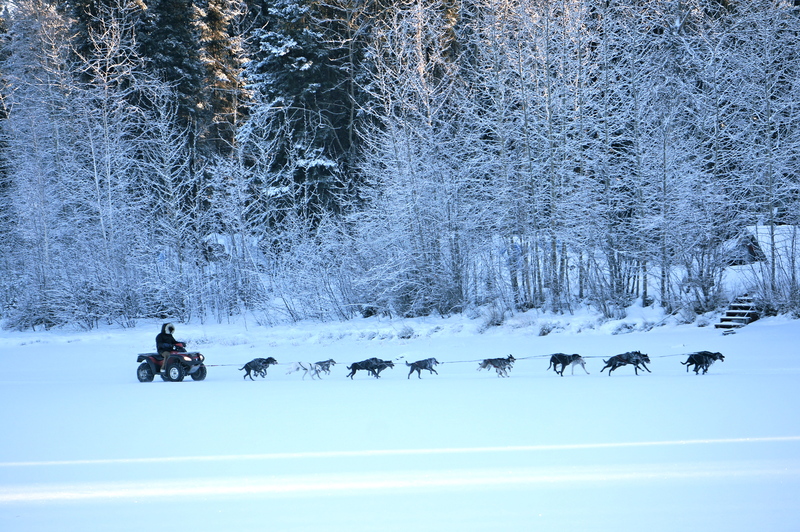 And then, directly across the pond from the princely throne a team of sled dogs races by, pulling a musher on a 4×4 ATV. We hear him shout “Hike!” and the dogs speed up, yelping happily. Clearly, they love sprinting in the snow, which has just turned powder blue, my favorite color. We watch until the team disappears, none of us saying a word. R bundles little r into his arms, warming the baby man’s body, and the two of them chant, “Hike! Hike! Hike!” jogging as fast as R can, back to our house, where hot chocolate and toy trains, and maybe a long nap are waiting. Thanks so much, Deb! How did you ever leave this incredible place? It just blows my mind to be in the middle of so much magic and mystery. 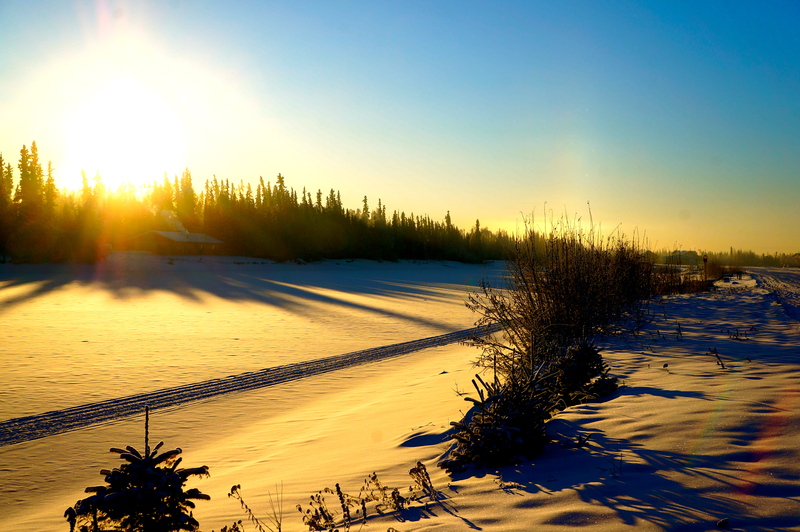 Alaska is a kind of paradise, as you know, and as I’m only just discovering. All the best! Susan, I know! I feel like you are seeing it exactly as I saw it: four eyes viewing the magic! Love your Robert Service reference, too. How did I ever leave? Oh, that was easy……came for a week, stayed 32 years, and even when we left they had to pry each of my ten naiils off before I flipped backwards back to Kansas, so to speak! Blessings on your Thanksgiving and enjoy the Aurora and all the other magic. Love to you and yours! Thank you, Deb. 32 is a lot of years up here. Happy and WARM Thanksgiving to you and your family, as well. Love and hugs! Love, love, love! Painting with words. Such gorgeous images. Wow, thank you Sabine. I’m thrilled to read such a lovely comment from someone who paints as well as you do. All the best! Very good—lots to savor in this one–felt myself being pulled, guided, nudged in so many directions to so many places within myself—always your eye for detail, your sense of the divine within the ordinary, or non-ordinary—and the humanity, which bleeds and personifies every aspect—from the inanimate chair and train, to the very much alive canine brethren, your grandson, and the big bright cessation of light above–and beyond–you capture the magical realism—as it manifests—be it the burning hot high Pyrenees, or the frozen tundra of the great white north. Thanks for taking the time to read and comment, J. I so appreciate your feedback and particularly love “…you capture the magical realism…” It’s a challenging kind of vision I seem to have, seeing everything in that half-light, so I’m glad my glimpses are coming across a bit. Enjoyed this story Susan. Brought happy tears to my eyes that, I think if I was sitting outside where you were, they may transform into snowflakes. Bravo! Yes, love, it’s snowing here right now and the flakes look very much like Shannon tears. Thanks for sending them! You painted a picture with words and I was there! Wonderful! Glad you were there, Katie! Hope you brought your mittens! How refreshing to see in summer winter photos. Very beautiful. Thank you, Sartenada. They help to keep us cool on a warm day.